Even though corruption is necessary in life, he said. Our Venerable Father Dometian lived in the years of the Emperor Justin II, who reigned from 565 to 578, and the Emperor Maurice, who reigned from 582 to 602. Born of pious and wealthy parents named Theodore and Eudocia, he received a thorough education in both secular and sacred knowledge. After he had lived in lawful wedlock a short time, his wife died, and he, for his virtue and learning was made Bishop of Melitene in Armenia at the age of thirty. Blending his political sensibilities with his ascetic training, he was not only the cause of the salvation of the provincial Christians, but of the entire Roman race. After being asked many times by Emperor Maurice, he was sent to Persia and was entrusted with the dealings of Byzantium with Persia. And when Baram rose up in a civil war against King Chosroes II of Persia, and he fled from his throne, Saint Dometian helped to restore Chosroes to his throne. By this success, Chosroes submitted to the Romans, and he was made to pay a tribute to them. As a kinsman and trusted friend of the Emperor Maurice and his wife, he received from him a great amount of money, which he spent on the building of churches and the help of the poor. 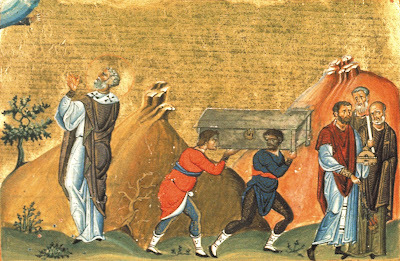 While in Constantinople, he departed to the Lord in the year 602. His relic was honored by all the regiments, both imperial and ecclesiastical. Thus he was placed in a coffin and carried with lamps and hymns to his homeland. He also worked many miracles both in this present life and after death. Thou wast entrusted with the care of the flock of Christ, as one pure and filled with divine Light. Thou didst adorn the vesture of thy priesthood with asceticism and many miracles. Thou wast a foremost Hierarch of the Church, O Venerable Father Dometian. When divine love made of thee the Holy Spirit's pure vessel, thou didst shine forth from on high in the august Church of Christ God; eminent in the great grace of the sacred priesthood, thou wast shown to all as ven'rable for thy virtue, O Dometian, thrice blessed, thou fair adornment of worthy high-priests of God.